Diana is a 5 ½ year old brindle female born July 30, 2012. Her dam is E’s Taylor Swift and her sire is Greyt Tornado. 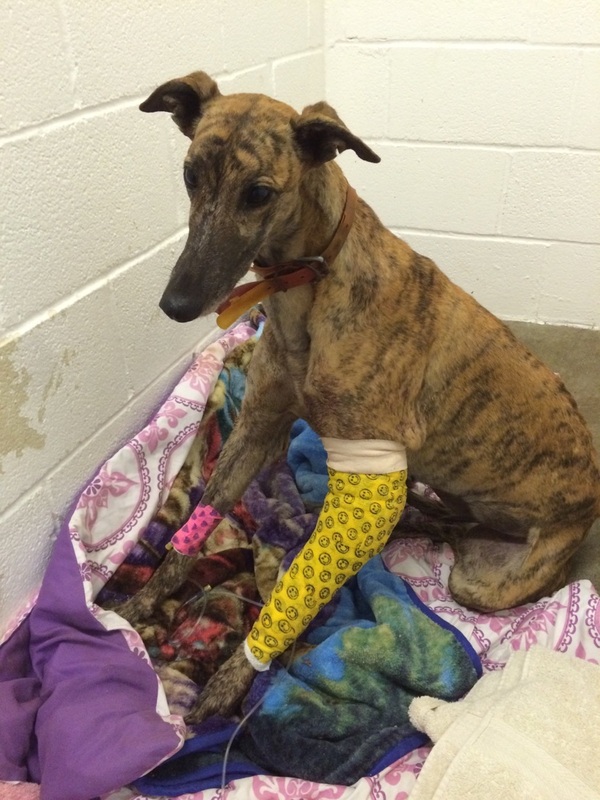 Diana is tattooed as the "D" pup and is not individually registered with the National Greyhound Association. Diana was hit by a car in Amarillo on November 16, 2016, and picked up by Amarillo Animal Control. She suffered a shattered left elbow as well as multiple open wounds. GALT’s west Texas representatives brought her to Dallas where she had surgery on Monday, November 21 at the Dallas Veterinary Surgical Center by Dr. Bob Radasch. Diana's elbow was stabilized with a bone plate and screws, which may have to be removed at a later date. Because of this very difficult surgery, Diana's cast is quite cumbersome in an effort to protect and provide healing in this very tedious area. She will receive weekly bandage changes for the next 8-9 weeks. Diana is not considered be cat or small dog tolerant at this time. Diana's leg has healed and she has a good range of motion after physical therapy. However, she will always have a slight limp due to the severity and location of the break at the elbow. 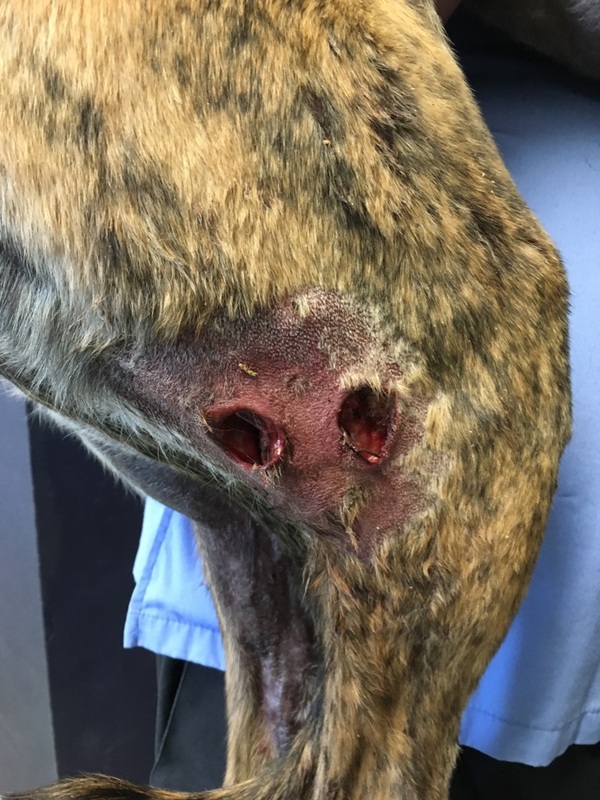 In addition, Diana's blood tests indicate she has been successfully treated for the positive titer to Ehrlichia Canis, and her PCR test is negative. This petite girl has completed all her medical procedures and is ready to find her forever home! 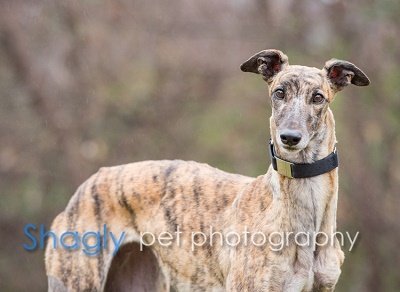 Diana is a beautiful dark brindle who will be 5 in July. She has amazing house manners - no trash diving, no counter surfing, no begging for food, and has not had a single accident in the house in the few months I've had her. She is very shy and very quiet. She is easily startled by noises and things that look like sticks although she doesn't seem to mind quiet thunder. Diana likes to be wherever her person is. She will warily approach new women and is shy around men. She easily adjusted to my house and sleeps in the bedroom with me. She didn’t particularly care for her crate at first but she is much better now. I feed her in her crate with an open door and she’s fine with that. I don’t need to crate her while I’m gone and when I return everything is fine. When I come back after being gone for a few hours, she talks until I get into the house. (I don't think she cries while I'm away.) When I return from being gone I usually need to walk outside on the patio with her. Within a very short time she goes off on her own in the yard and I go back inside. Diana loves affection and comes when called. She's a great eater and walks well on a leash. 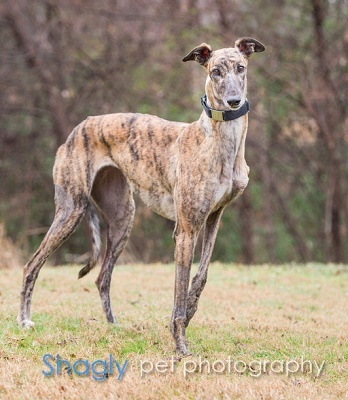 Diana does fine as an only or in a home with another male greyhound; however, no small dogs or cats please. She's a wonderful girl and will make a great companion in a quiet household. The special medical treatment cost needed by Diana is why the Miss Mesa Fund was established. If you would like to help with Diana's care, please take a moment to make a donation to the fund. 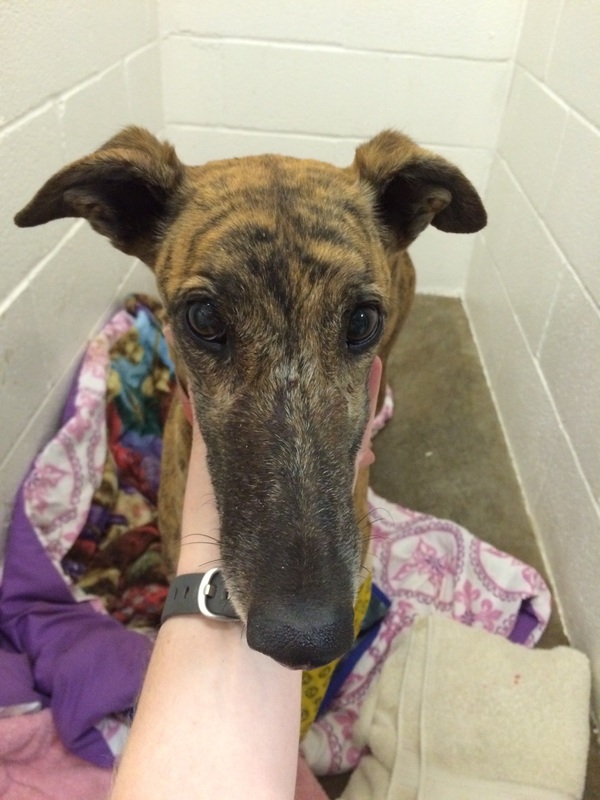 You WILL and CAN make a difference in Diana's life and the lives of other greyhounds in need of special medical care. Your help and support will make a difference - one greyhound at a time. Please note Miss Mesa Fund/Diana on your check.